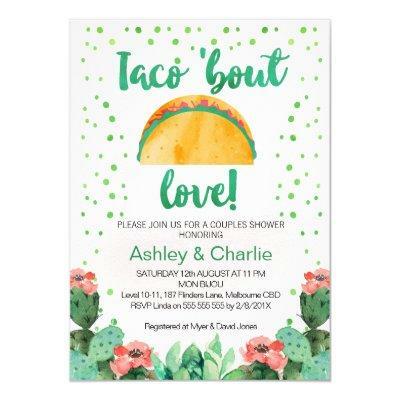 Looking for a couples taco &#;bout love shower invitation? This design features a large brush calligraphy heading that can&#;t be altered and some flowering cacti in the lower half of the design . The background is a white scanned watercolor paper image with watercolor polka dot pattern around the edges of the invitation. This taco &#;bout love couples shower invitation is ready to be personalized. More designs are available at the store.